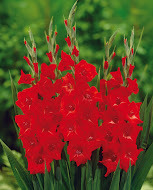 Matchpoint is a striking inferno-red Glad ideal for the cutting garden or the back of the border. Did you know that gardeners all over are reporting increasing success with leaving their Glads in the garden over the winter in areas as low as zone 5. 7 corms/pkg.